NOTE as warned on the link you need to check as they do NOT all cover all versions., so you need to examine each one and click on products supported. HOWEVER I suggest you return to my earlier post and boot with the onboard graphics connected and the ATi drivers again uninstalled..
Until you do this we will not I think make any progress. 2. If that was heavily coated in dust HOW is the fan on the CPU, that is the one that is on the Motherboard, so to speak, as against in the case metal itself. 3. If that is dirty - how are the cooling fins of the CPU below the fan. 4. You say - I wonder if the fan is no longer working - check it with the case open. CAUTION if you do not know what you are doing, WAIT for advice. please, before you start to clean anything. ALSO I think that we MAY have some confusion here. 1. 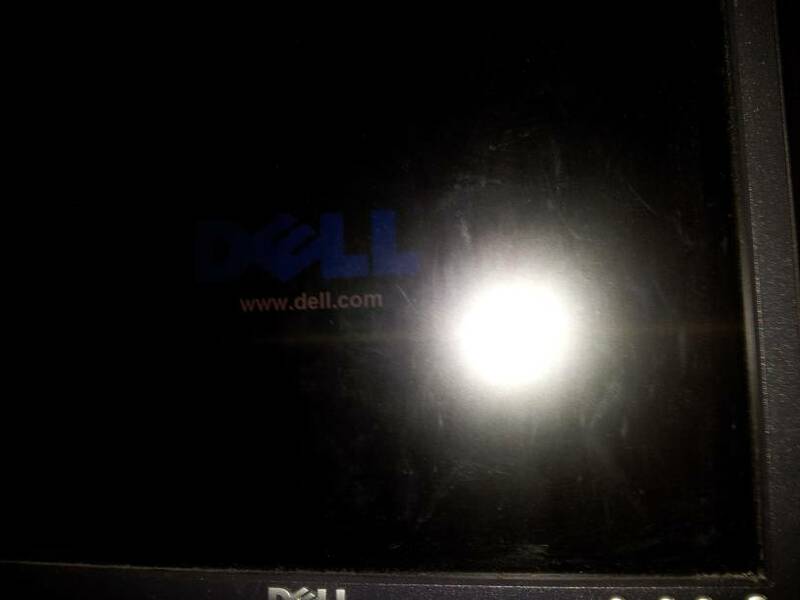 When I turn on the power at the wall, I get a Dell splash screen. This appears uncorrupted. 2. When I press the power button on my PC to start it up, I get another Dell screen, and this one is corrupted. 3. 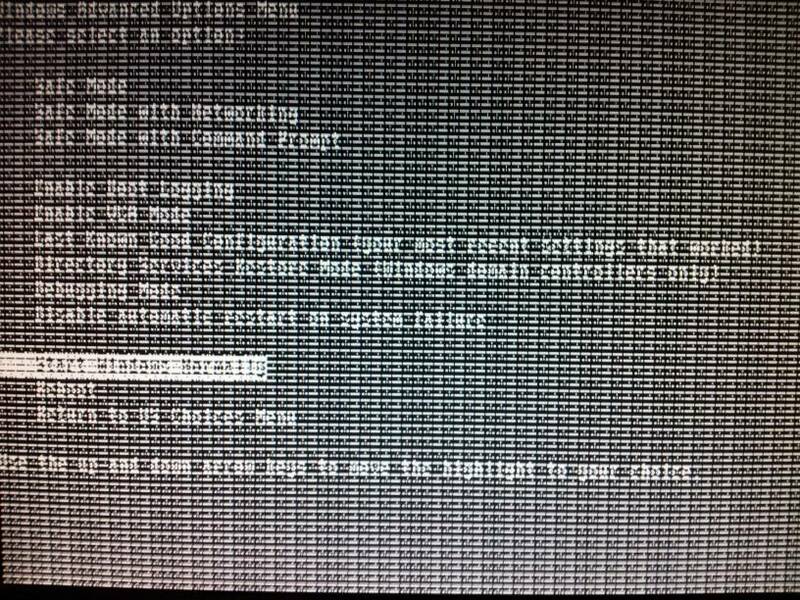 When I press F8 to go into the boot menu, the menu comes up corrupted. 4. 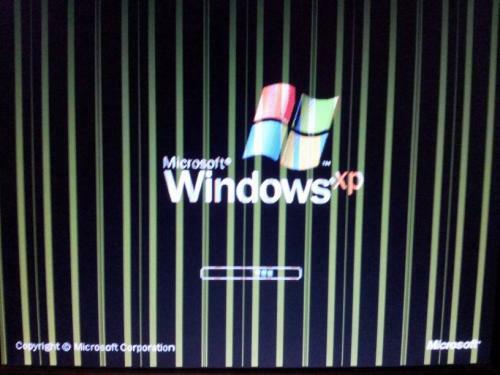 When I boot into VGA mode (or safe mode), the Windows screen that is displayed is corrupted. 5. 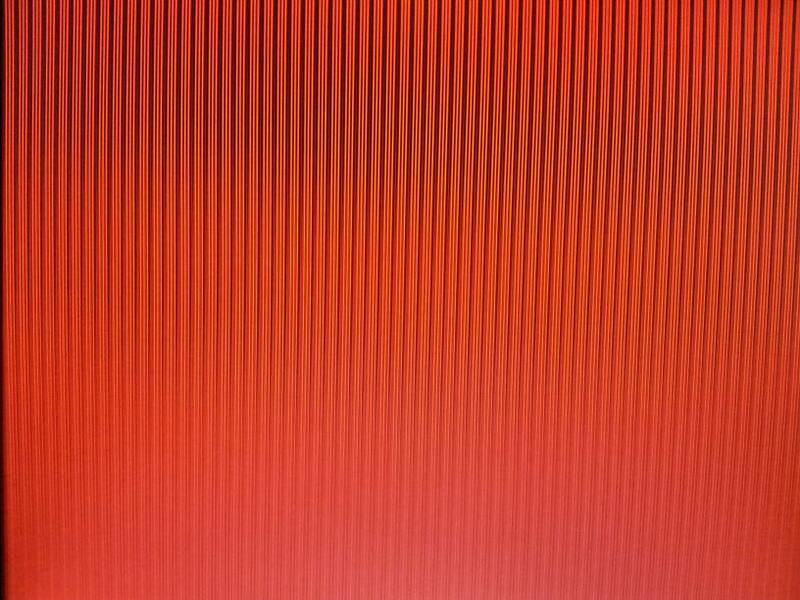 If I boot into normal mode, the screen eventually goes black with red vertical lines and then gives the BSOD. Screenshots are attached. These have been taken with a camera as of course Print Screen is not available until Windows is booted up. Please excuse the reflection of the flash in the first picture. That sure looks like a hardware problem. Either the screen or the video device. Well as my colleague Ztruker says and I said before - Other monitor try, connecting cable on this monitor - try other if possible, take out the graphics card and boot to integrated graphics chip. Like Ztruker I am even more convinced now, as until your last post I misinterpreted what you said, I realise now that it was me that misread it, but I thought it was OK in Safe Mode or VGA mode. Do you have an update for us please. How did you progress if at all. I will look into swapping the monitor for another. I am still unsure how to remove my graphics card. There is a blue plastic clip to one side of it but I'm not sure how to push or pull it to release the card, if that's what it is for. Is it possible to disable the graphics card or do I need to physically remove it? A friend of mine has a spare Geforce graphics card that he no longer uses. Would I be able to use that with my PC? I can provide the spec of the card if you require further details. 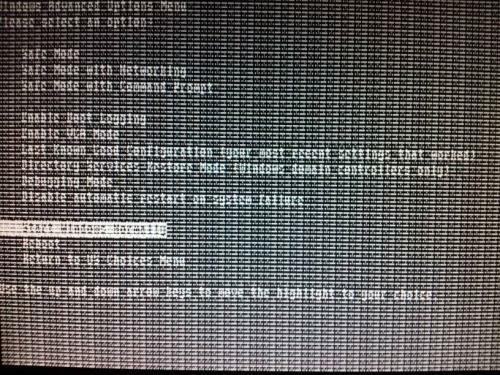 How do I boot to the integrated graphics chip? Will that option show up when I press F8 on rebooting after the card has been removed or disabled? Is it possible to disable the graphics card or do I need to physically remove it? and I will always give you the same reply. 3. You have that Ati Radeon graphics card. You also have onboard graphics. YOU FIRST JOB - without ANY doubt, is to uninstall that card, when you say you cannot see how it fits in and there are no clips like on the ram, I think it is in a PCIe slot and there are NO clips. On an AGP (Advanced graphics port) there is a small clip at the back end of the slot, that locates in the card. IT IS NO USE simply connecting to the VGA port on the I/O plate at the rear of the case, that is near to where the LAN is connected and the USB ports, as that will NOT cover the possibility of a defective card causing errors across the PCI bus on the motherboard. You then need to check in BIOS if onboard graphics are enabled, if you DO NOT get an image on the monitor on boot. If you uninstall the driver for the card, ensure the driver for the onboard graphics is installed and in the BIOS enable the onboard graphics, that is the procedure. HOWEVER as I have said, that will not cover the possibility that you yourself raised on your first post that the graphics card is damaged. Depending on how the card is damaged, if it is, the the card will still receive a power supply from the motherboard and if the card has a fault, that is then effecting the whole circuitry of the system , then the ONLY solution is to remove the card. As I have said all along I do not know, if this will solve anything, but it is the way forward. I cannot give you exact instructions for removing the card, but generally you unscrew the small screw that holds the card in the plate of the case. However on some computers there is no screw and the cards are secured by a lift-up plastic bar, for want of a better word, that pulls away from the case and then lifts up on a hinge. Having done that first, you then release the clip on the lower edge of the card that you have mentioned. Again I cannot give you exact instructions for your computer, but usually on close inspection, you can see the clip and you can see that it has a small projection that locks into a notch on the lower edge of the card, normally you push gently on the clip to move it GENTLY away from the card. You then taking hold of the card gently ease it out of the slot, make sure the clip does not spring back into place. 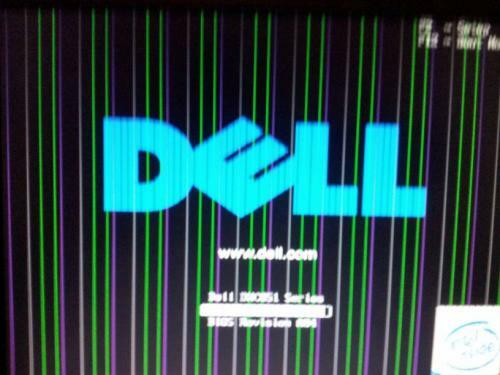 Below is the link to a guide for this procedure on most Dell computers. If you cannot work it out, then the answer, with the best advice that I can give you is that you will have to resort to either a knowledgeable friend, or unfortunately you will have to PAY at the local computer shop. I have finally got my computer working again. It took me a long time (mainly fiddling around trying to get the graphics card out), but at last I managed to do it. Thank you! * From the BIOS, enable onboard graphics. * Close down the machine. Unplug it and disconnect all cables and connectors. * Lay the computer down and take off the side. * While doing the following, touch the bare metal exterior of the case with your bare fingers from time to time to ensure you discharge any static. * With a Philips screwdriver, unscrew the tiny screw holding the graphics card in place. This is at the top of the card, at the end closest to the case. * At the bottom of the graphics card, at the end furthest from the case, there is a small blue lever. This needs to be pressed in or out (I forget which way) so that a small bump on it moves away from the card. * Holding the lever in that position, gently pull the graphics card up and out of the slot. * Close the case, reconnect the cables, and start it up. All being well, you should now be running from the onboard graphics. 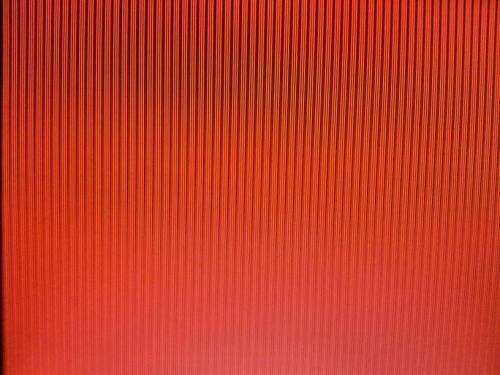 * The Dell start-up screen appears with no lines on it. Once Windows boots up, click on the balloon that pops up telling you your screen resolution is low, and allow Windows to adjust it automatically for you. I now am running 24-bit graphics at 800 x 600 resolution. Fine details (such as text) are rather soft and blurred, but I think there might be a setting to fix that. I'm going to try a higher resolution to see what happens. Once more, thank you for all your help in getting this problem fixed. One last thing: I reinstalled the graphics drivers and changed the resolution to 1024 x 768, and problem with the fuzzy graphics I mentioned in my last post above has now been resolved.